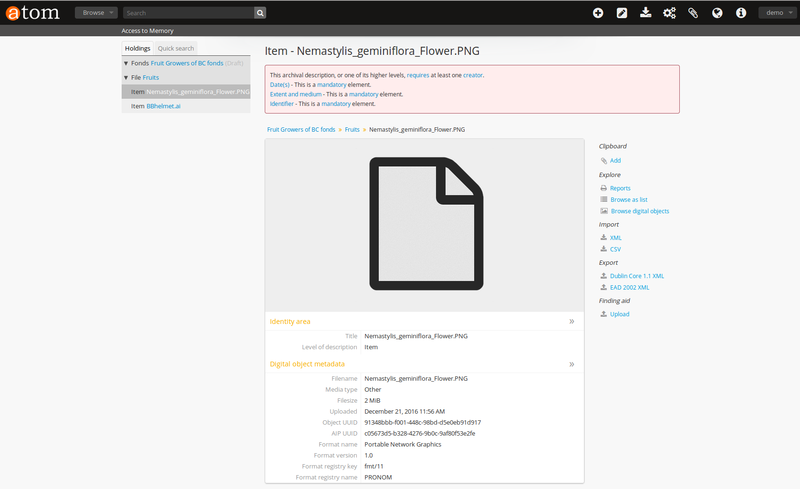 Archivematica 1.6 is a legacy release, and these documents are no longer being maintained. During ingest, access copies of digital objects are generated and packaged into a DIP (Dissemination Information Package). The user uploads the DIP to the access system, or stores it for future use. 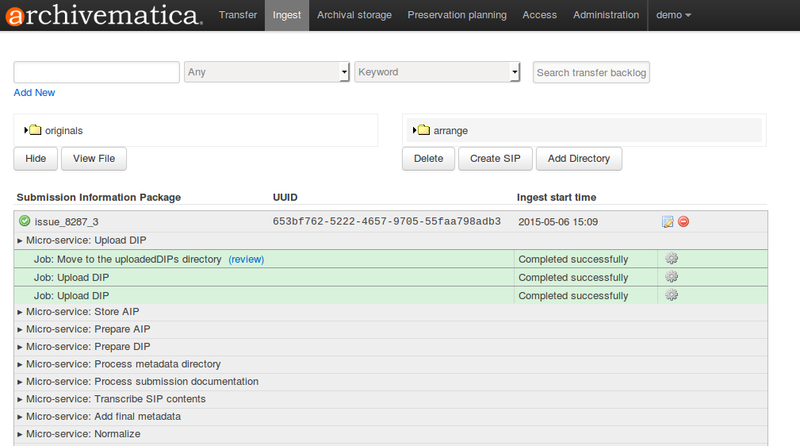 Archivematica has also been developed to integrate with ArchivesSpace and Archivists’ Toolkit. When the DIP has finished uploading, open the Access tab in the dashboard. This tab shows the AIP and its uploaded DIP. Click on the DIP URL to go to the uploaded DIP in AtoM. You will see an archival description with the metadata you added during ingest, displayed in the context of the level of archival description to which the DIP was uploaded. To view an individual digital object, scroll through the thumbnails on the left of the screen and click on an image. In Archivematica 1.6 and higher, you can send AIP object metadata to AtoM without uploading dissemination copies of the files. This may be a helpful workflow if you have digital objects which you wish to make discoverable, but not displayed online for rights or privacy reasons. On the Assign Objects screen, select which objects you would like to assign to which resources. Using the filter boxes in the top right, it is possible to search for specific objects or resources by name. Once you have selected the objects and the resource you would like to pair them to, click Pair in the top right corner. Repeat steps 2-4 as needed. When prompted to Upload DIP, either choose Store DIP, or choose to upload to your desired access system. If you choose an access system, a second Store DIP option will be presented to you. Choose the DIP storage location from the configured options. The DIP will include the access copies made through either Archivematica’s normalization rules or a manual normalization process, thumbnails, and the METS file. Your ability to view the objects in the browser will be dependent on your browser having a plugin for the particular filetypes. However, all files can be downloaded locally in this manner.